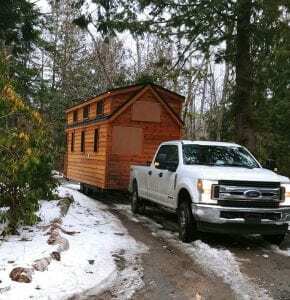 Kristin's new tiny home arrives from Colorado Springs. Photo credit: Kristin Noreen. Two friends and I waited at the end of the driveway, stamping our feet in the cold. 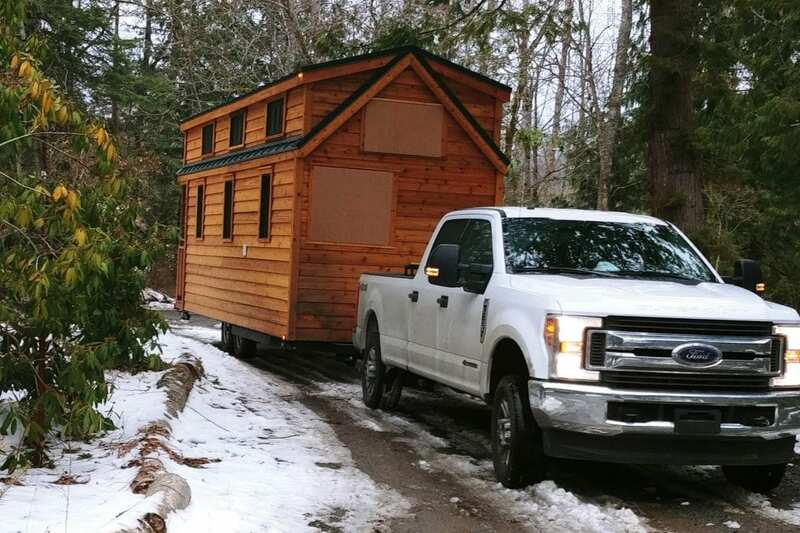 One friend started to tell a joke and I interrupted – “There it is!” I cried, the moment I spied my tiny house lumbering down the driveway, pulled behind a large pickup truck. Even with boards over the windows, covered in truck spray, it was so beautiful. And it was mine. Mine in a way my condo never really had been. Sure, I don’t own the land where it sits, but I’m free to pick up and move it at any time. Not that I want to – I chose my first RV pad well. It’s a lot of work to set up a tiny house and I was prepared to not sleep in it the first night. But it took six days to get to the point where my two cats and I could fully move in. Kristin poses on the front porch of her new, tiny home. Photo credit: Kenn Rich. First, you have to level the house. I chose to put mine up on blocks and take the weight off the wheels to preserve the tires. It’s not as permanent as it looks and it won’t take much to set it back down when I move on. Next, you hook up the utilities. Mine is all electric and has a flush toilet. My host didn’t want me to use standard RV sewer hose, so he made a proper angled hard-pipe connection. I feel much better about that, but I’m still careful to go easy on that toilet. My water hookup was done in freezing weather during a weeks-long cold snap. I’ve heard plenty of frozen pipe stories on Tiny House People (one of many social media groups for tiny housers), so I used a high-end water hose with built-in heat tape and a thermostat. Making a bed in a loft is hard, but sleeping in one is as close to heaven as it gets. First of all, I don’t have any upstairs neighbors coming home drunk at 11:30 p.m. And it’s dark at night here – I can see stars! After years of motel-parking-lot-style lighting battering through my drapes, this is a huge relief. 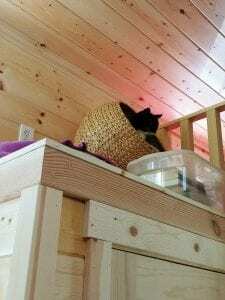 The closet roof “dead space” provides perfect cat habitat. Photo credit: Kristin Noreen. I’m so snug in my little loft, I feel like no one can find me. It never occurred to me to be afraid sleeping alone out in the woods. I’ve been sharing a wall with a drug-involved person with guns for 12 years. At least now there’s a chance I’m not going to be around that during the night. Even after putting most of my stuff in storage and bringing over the bare minimum I need to get started, I felt surrounded by clutter. Soon, though, the space took shape. I adore my office—it’s a 3-by-6-foot room with a shelf alcove, designed to fit a twin bed. I chose to use it as my home office, and it’s the perfect size for a writing room. I ran a DSL from my host’s house out to my tiny, and I have wifi coming from the utility closet for a strong signal everywhere, even my outside sitting area. My Aeron chair just made it through the office door. 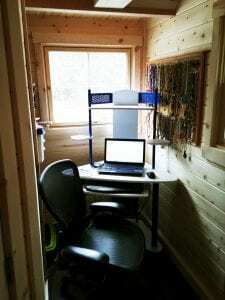 A tiny house with a dedicated office! Photo credit: Kristin Noreen. My sleeping loft has stairs and my storage loft has a ladder. I’m surprised how easy it is to get things up and down the ladder; I’ve moved stuff up there myself that I never imagined I could without help. It’s weird to climb a ladder to get tomorrow’s outfit, but it makes a certain sense to have everything in neat, lightweight plastic drawers. My cats adore the space. I let Timbits, my big male, outside for the first time this morning and he was overwhelmed after three minutes. He’s napping it off now. Kali, my tiny old lady, nimbly scoots across the heat pump and steps around my dishes on the kitchen shelf to access the second loft, where her heavy brother can’t get to her. That is, until I build a proper bridge to keep Kali from stepping in my dishes. I can’t get over having hot water on demand. No waiting for the shower to warm up; it’s six feet from the water heater. My bathroom fixtures are gorgeous and the pine walls feel like the 5-star Colorado resort town where my house was built. 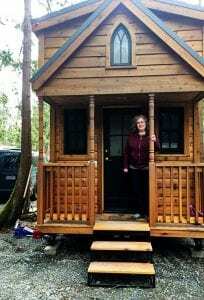 Kristin’s new tiny home arrives from Colorado Springs. Photo credit: Kristin Noreen. Feeling at home in a new house is all about routines, and moving forces me to re-think all of mine. Some must be changed to accommodate a different space; some can be resumed for that feeling of familiarity one craves in a strange new place. I made my favorite meal last night on the new induction range. (I’m pretty proud of myself for making perfect wild rice on my first try.) I’m starting to have ideas for making certain spaces work better, and each improvement brings a little burst of joy.